Abstract: Creating fully customizable reports that meet the variety of needs outlined in the ASTM D5769 Standard Test Method for Determination of Benzene, Toluene, and Total Aromatics in Finished Gasolines by Gas Chromatography/Mass Spectrometry can be a challenge. 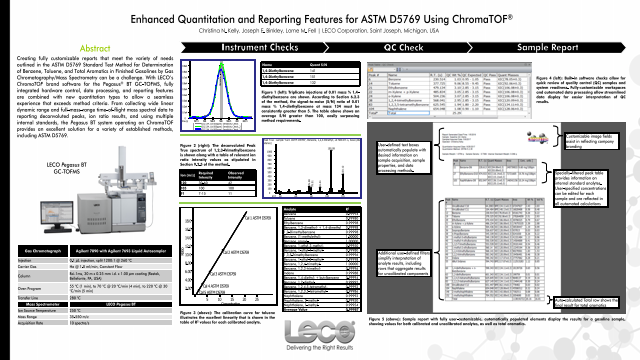 With LECO’s ChromaTOF brand software for the Pegasus® BT GC-TOFMS, fully integrated hardware control, data processing, and reporting features are combined with new quantitation types to allow a seamless experience that exceeds method criteria. From collecting wide linear dynamic range and full-mass-range time-of-flight mass spectral data to reporting deconvoluted peaks, ion ratio results, and using multiple internal standards, the Pegasus BT system operating on ChromaTOF provides an excellent solution for a variety of established methods, including ASTM D5769.